According to their Facebook page Lobaev Arms is a Russian manufacturer of high end precision rifles and was founded in 2005 and is located in Kaluga which is 150KM southwest of Moscow. 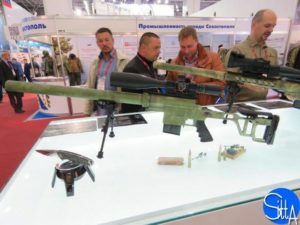 They purport to be suppliers of sniper rifles to Russian security services which may be unprecedented for a privately operated company operated in Russia. The Russians have a history with using subsonic ammunition in accurized platforms. The VSS Vinorez, which is in service with the Russian armed forces utilizes the 9×39 cartridge. I’m not holding my breath for these to be imported into the US for civilian sales, however the 40 Lobaev would be an excellent choice for those needing a subsonic platform and require the additional energy delivery at close ranges.